Expertise isn’t what it used to be. Beginning with the industrial revolution and continuing into our modern information age, new technologies have altered our view of expertise and influenced the degree to which we pursue it. Technologies, properly understood, are tools that we humans create to augment our abilities. Good technologies are created and used by experts to extend their skills, not to replace them. This relationship between experts and the technologies that they use was much clearer before the industrial revolution. Skilled craftspeople—carpenters, blacksmiths, cooks, farmers, and even accountants—cherished their tools and used them well. They understood which tools to use, when to use them, and how to use them productively. Their tools were a natural extension of their minds and bodies. Since the beginning of the industrial revolution, however, many tasks that were performed by humans in the past are now performed by machines. This is a mixed blessing. Some tasks can be performed better by machines, such as fast mathematical calculations done by an abacus, calculator, or computer. Some tasks that can be done better by people, can be done by machines more cheaply, so we sometimes sacrifice quality for affordability, such as when we buy a piece of manufactured furniture rather than paying a skilled craftsperson to build something better. Some tasks, however, can only be performed by humans and can at best be augmented by technologies. Data sensemaking and communication fall into this category. What happens when technologies are used to do what only humans can do well? The outcomes are poor in comparison and people are discouraged from fully developing those skills. Similarly, what happens when the tools of a trade are designed by people who don’t understand the trade? Again, the outcomes suffer and people with expertise are frustrated in their efforts. If you were a warrior of bygone days preparing for battle, would you buy a sword made by someone who didn’t intimately understand its use in battle? Not if you wanted to survive. Most data sensemaking and communication tools are dull blades with slippery hilts. My field of data visualization—the use of visual representations to explore, make sense of, and communicate quantitative data—falls into the broader category of knowledge work. Expertise in knowledge work can be difficult to assess. This is different from expertise playing the violin or performing gymnastics. Over hundreds of years, clear standards and measures of musical and athletic performance have been established, along with clear methods for developing expertise under the guidance of teachers, mentors, and coaches. Unlike these areas, methods for developing skill in data visualization are not firmly established. The field of data visualization is chaotic. We can’t even agree on a definition of the term, let alone determine what qualifies as expertise and the path to developing it. In my own mind and work, however, the field is clearly defined and the principles and practices, although neither complete nor fully formed, are firmly rooted in science and years of practical experience. During the 20th century and so far in the 21st, we have watched in amazement as musicians and athletes have achieved what was previously thought impossible. Expertise in these realms has increased as each new generation built on the foundation of its forebears, coaxing their brains and bodies to reach new heights through increasingly advanced training regimens. In the 1908 Summer Olympics, a diver barely averted disaster when he attempted a double somersault, which was considered too dangerous, prompting recommendations that it be banned from competition. Today, the double somersault is an entry-level dive. Ten year olds can perform it perfectly and in high school the best divers are doing four and a half somersaults. Sadly, similar advancement is not happening among most knowledge workers. Are data sensemakers and communicators more skilled on average today than they were 50 years ago? I doubt it. In fact, it’s entirely possible that expertise in this realm has declined as technologies have displaced and discouraged the skilled efforts of humans. The web has contributed to the problem. Despite its many benefits, the web has provided a convenient platform for inflated claims of expertise. In data visualization, the actual number of experts is but a small fraction of those who boldly make the claim in blogs. And now, as traditional book publishers are scrambling to remain viable, they eagerly offer book contracts to any blogger with a modest following. You can get a book published without first developing expertise in the subject matter. The book Data Visualization for Dummies by Mico Yuk is a vivid example. Apparently Wiley Press forgot that “for dummies” wasn’t meant to be taken literally. Don’t claim expertise that you don’t possess. Never inflate your abilities. False claims do harm, even to yourself. If you believe that you’ve already reached the heights of achievement, you’ll spend your time demonstrating and proclaiming your minor achievements, rather than working to improve. You can only evaluate your own expertise by comparing yourself to experts, not to others with superficial knowledge and skills on par with your own. Forming a mutual admiration society built on mediocrity might feel good to its members, but it isn’t progress. What’s especially disheartening about the current lack of expertise in data visualization is the fact that expertise is within reach. Expertise is not an exclusive club of the uniquely talented. We can all develop deep expertise in a chosen field. In every field of pursuit, we develop expertise in the same way: through a great deal of study and practice. The only natural talent that’s needed for developing expertise is one that we all possess: highly adaptable brains and bodies. We humans are the animal that learns. But if we trade this evolutionary advantage to instead become the animal that is shaped and limited by its tools, we won’t survive for long. I recently wrote about deep work, the focused activity that is needed to perform at optimal levels. Now I’m talking about a kindred process, deep learning, which is needed to develop expertise. 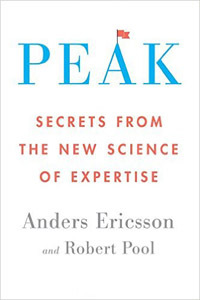 A wonderful new book titled Peak: Secrets from the New Science of Expertise, was recently written by one of the world’s great authorities on the topic, Anders Ericsson, with the help of science writer Robert Pool. But we now understand that there’s no such thing as a predefined ability. The brain is adaptable, and training can create skills…that did not exist before. This is a game changer, because learning now becomes a way of creating abilities rather than of bringing people to the point where they can take advantage of their innate ones. In this new world it no longer makes sense to think of people as born with fixed reserves of potential: instead, potential is an expandable vessel, shaped by the various things we do throughout our lives. Learning isn’t a way of reaching one’s potential but rather a way of developing it. Expertise is potentially available to anyone who will commit to a prolonged and disciplined process of deliberate practice. When I wrote my blog piece titled “Data Visualization Lite” not long ago, some of you might have thought that I was stroking my own ego by expressing dissatisfaction with the accomplishments of newcomers to the field. That wasn’t the case. I am genuinely discouraged by the paucity of good infovis research, by the redundancy and errors of most recent books on data visualization practices, and by the mediocre design and functionality of data visualization tools. I want us to do better and I know that we can, but not by doing business as usual. The rapid rise in the popularity of data visualization, which began a little over a decade ago, has done more harm than good. Popularity often breeds mediocrity. We must stuff socks in the mouths of marketers and shift the message from the gospel of salvation through technologies to an emphasis on human skills. I’ve dedicated my professional life to the development of these skills, both in myself and in others. I want the efforts of others to surpass my own. I want to be left in the dust, rather than constantly looking back and yelling “This way. Hurry up!” This will take deep learning that builds on the best work that’s been done so far. There are no shortcuts. Expertise is the result of hard work, and at times it is no more fun than practicing the violin for several hours every day, but it’s worth it. I just finished reading Peak and really enjoyed it. I think reading that book along with, “A Mind for Numbers” is a great combination for those looking to learn a new skill or develop expertise in a given field. This is so very relevant to a wide array of the blogs and twitter circles that I keep aware of lately. I don’t consider myself an expert, but I do consider myself a skilled and knowledgeable practitioner, and it is increasingly disheartening to see the big rounds of pats on the back and excited promotion of many mediocre, and even many outright bad, data visualization undertakings. This sentence jumped out at me. Having followed Mr. Few’s blog for a few months, this seems to be a recurring theme. As a neophyte, I struggle with how to pursue deliberate practice when I can’t determine who the right experts are. I’m currently reading “Signal”, and the sub-title seems apt to my situation: “Understanding What Matters in a World of Noise”. Data visualisation, as a field, is noisy. As a result, it’s difficult to determine who’s advice to follow. Once I’ve accepted that deliberate practice is necessary, where do I go from there? Alex, I have a similar issue but mine is around getting someone with more experience and knowledge than I have in dataviz to provide feedback on my work. I know my visualizations could be better but I don’t have a resource that I can get regular feedback from as to where I can improve. I understand and share your frustration that the field of data visualization is noisy. In my opinion, the best books for developing fundamental data visualization skills are my own and “Creating More Effective Graphs” by Naomi Robbins. For a deeper understanding of visual perception and cognition relative to data visualization, Colin Ware’s books are best. For those who need to create journalistic infographics, Alberto Cairo’s books are best. For discussion and feedback, make use of my discussion forum. If you’ve found other books, blogs, articles, or discussion forums that can be trusted for good advice, feel free to recommend them. Acquiring expertise requires a broad understanding of options available and a theoretical understanding of the subject. I have devoured Stephen’s books and review examples with analysis on existing visualizations. Stephen’s examples, on this website, are a great source. Since I have followed this path visualizations have been better received.